PayRentz provides Refrigerator for rent in Chennai for short term and long term periods. 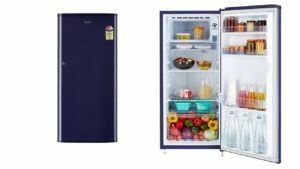 if you are looking for small and medium seized refrigerators for rent to your house, office, events then we can offer 190L fridge, Single door and 240L double door. we can work on for monthly, daily and for event specific packages. Refrigerators from leading brands are provided on rent, transport, delivery, pick-up and service assistance are provided. For more details please write to rent@payrentz.com or visit www.payrentz.com or call +91 8939581818.